Please read ALL sections below first and be sure to state your preferred date or dates. Also the kind of class or course you wish to take if you know. 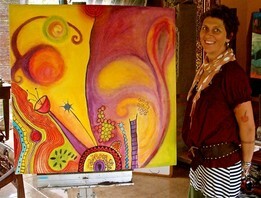 However, many clients prefer to decide the kind of art they want to explore at the start of the class. A great many of our clients just want to have a unique creative/imaginative experience unlike anything they've done before. We will then e-mail you back by return to confirm your booking. When do the classes usually occur? Regular classes are available from Monday to Friday, 10.30 AM to 1.30 PM. Afternoon classes are sometimes available by special request. Please note that our classes must be booked at least one day in advance, preferably by email and confirmed by reply. What is the cost of classes and courses? **10% discount applies on the Single Class price for courses of 3 or more classes. Payment is in IDR cash at the end of the class. We currently do not accept credit cards. The minimum number of classes for a course is 3 classes. Payment for the course is at the end of the first class. This guarantees your booking. At this point we arrange dates for the remaining classes. The dates can be changed with one day advance notice. Courses of at least 3 classes requested 10 or more days in advance require a 50% deposit to secure the booking. ​How do the classes work? What are some of the content or subject choices? Daily classes are kept small so everyone gets a lot of personal attention. This can vary from one person to a maximum of around 4 or 5 people in a class. ​Portraiture etc., then we group clients together on specific days whenever possible. Can I use the studio space without formal classes? ​Yes, whether you're an experienced artist or would simply like to explore painting at your own will our large studio is a great space that is available for your use. Please click here to see our membership page for more information. ​What If I need to cancel a class? ​Clients are requested to notify us of any cancellations by email at least 24 hours before the scheduled class. What are the opening hours for the Gallery? Please note that our gallery exhibition hours differ from classes and courses. 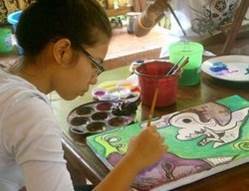 Because each client is treated very individually, our classes are suitable for beginners and advanced artists alike. 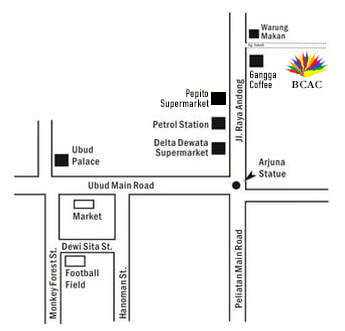 ​How do I find the BCAC studio? From Jl. Raya Ubud, head East towards the big white statue T-Junction and turn left onto Jl. Raya Andong. Continue straight for 500m and you will pass the Pertamina (Petrol) station on LH side. Our building will be located in an alley right behind Gangga Coffee. Please click the left map for Google maps or the right map to enlarge. 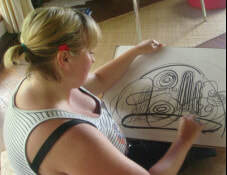 ​An increasing number of clients are coming to us these days for art therapy. This includes people seeking a therapeutic experience for themselves and also practicing art therapists and professional psychotherapists interested in exploring our unique approach to art therapy. This short video records the experience of Carol Hogan who has Parkinson's disease and was looking for new ways of dealing with her condition. 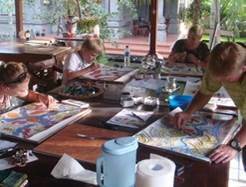 Bali Center for Artistic Creativity offers classes, courses, workshops, seminars and instruction to individuals and groups interested in discovering, experimenting, developing or extending their artistic creative talents and skills. People come to BCAC from a wide variety of backgrounds, professions and occupations. We also work regularly with International School groups and Local Charities. We arrange classes and courses on an individual basis. 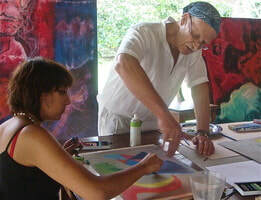 In this way you develop skills based on your individual interests and focus on areas of art that you want to explore. In this way you can get the most out of your time at BCAC. Generally our classes are small, we work with around 1-5 people maximum per class. Larger groups are booked separately. These classes are fun, dynamic and can be very rewarding. Please click on text or images below to be redirected to your page of interest. Our Education Without Walls programs offer a combination of Visual Arts education, Community Outreach (I.B.CAS), Cultural Learning, Adventure Activities and more. The programs are individually tailored to each school. Contact us to find out more. This video of an experimental painting class has received over 30,000 views on Youtube. 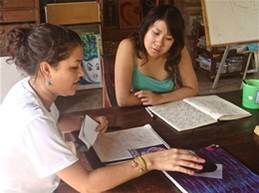 Tanti and Wendy, like many, came to BCAC to learn Rudolf Steiner color theory and unlock their creativity. See this video to find out how they succeeded. In this video Bruce demonstrates to a client how to color/shade a self portrait and offers a few tips on how to create a successful self portrait. Self portraits are an excellent way of nourishing skills in drawing, painting and observation.